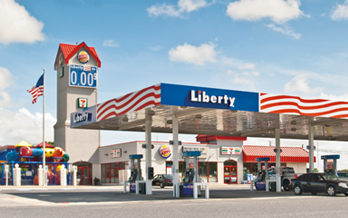 Liberty Petroleum was founded in 2000 by three veteran mid-Atlantic distributors with a straightforward goal: to level the playing field for independent distributors like you. Association with a widely recognized, first-class brand. Over the years, these advantages have become even more important. In addition to major oil companies, consumers can now buy gas from big box stores and grocery chains, while the big C-store chains are expanding. In the face of these challenges, distributors from around the country are joining the Liberty team. Today, they are flying the Liberty banner at more than 400, distinctly branded Liberty retail locations around the country, from New Jersey and Louisiana to Kansas and Idaho. And as more and more people hear about Liberty, we continue to grow. In the years since we launched Liberty —a company built by distributors for distributors—we've demonstrated that you can count on Liberty, to understand what you need to compete. For updated news about Liberty and the petroleum industry, and to view special programs and offers for Liberty dealers, see the Liberty News page. A company built by distributors for distributors.